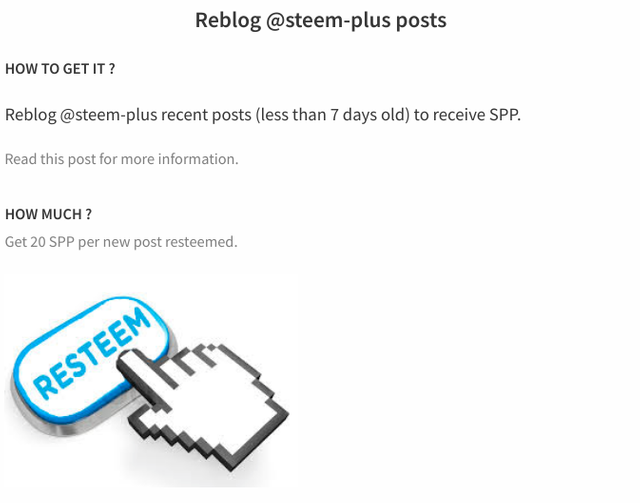 Reblogging (or resteeming) a @steem-plus post will now earn you 20 SPP. That s an easy way for you to accumulate a few extra SPP over time while helping us promoting the service. It will only work if you reblog a blog less than 7 days after it was posted to the blockchain. In order to do this, we used @arcange 's SteemSQL to fetch the applicable reblogs. 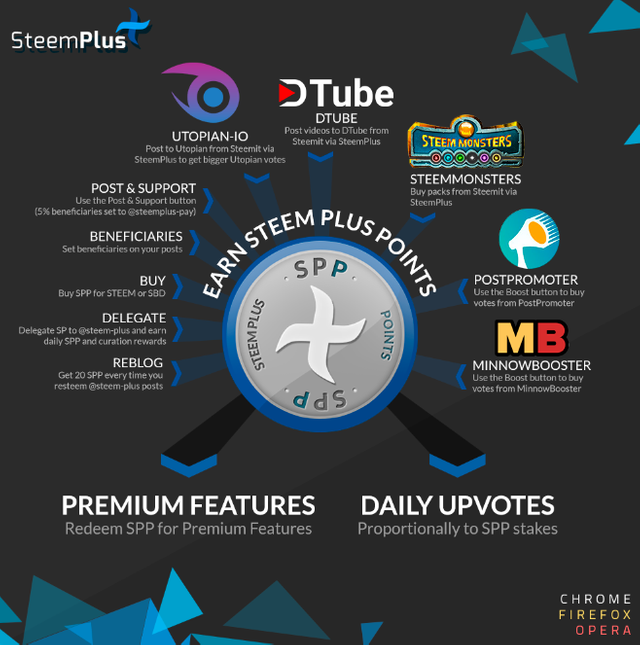 SteemPlus Points are utility tokens that will grant you a vote from @steem-plus according to your SPP stakes. In the future, they will also be redeemable for premium features. Huge thanks to @fabiyamada for this awesome infographics! Reblogs will be added to it in the future. We received more than 2 000 SPP from many of our users! If you want to delegate to us to earn, check this post, delegating is the easiest way to earn passive SPP income! 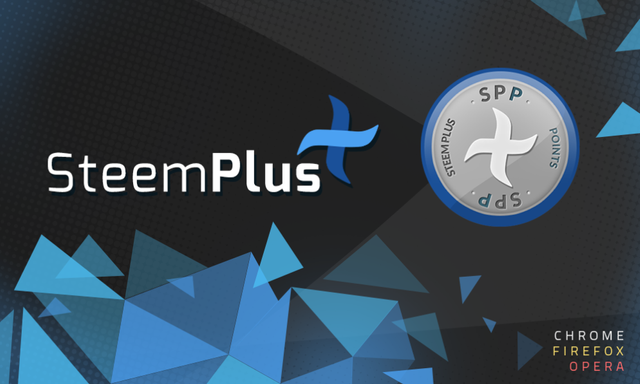 Additionally all the money generated by SteemPlus is powered up and delegated to the @steem-plus account. In only a few weeks, this delegation is already over 600 SP. We wanted to get a lot of things done before the SteemFest and were keeping a very fast developing pace. Now that much has been done, it is time to refractor the API that has become really hard to read in its current state. We ll make it a priority! @steem-plus will soon start to publish daily SPP stats updates. In the meantime, you can check our API to see how you fare in terms of SPP compared to other SteemPlus users, see how the SPP are distributed and what is the total number distributed. You can download and install SteemPlus directly from the Chrome Store if you are using Chrome or Firefox(follow this link for Chrome, this one for Firefox ). For installation procedures on Opera, please check our documentation. Updates shouls occur automatically. If not, click right on the extension logo > Manage my extensions > Update. Thank you for your contribution. Though the development work is less compared to your previous contributions, it still holds a great value to people and helps them to earn SPP. Sometimes even small steps are a way to success. In any case, I confirm a satisfaction for me! Thank you. Thank you for your review, @codingdefined! So far this week you've reviewed 12 contributions. Keep up the good work! Thanks. I reblog this article and it's really fine. i have buy a few SPP, but dont get vote? why? You did get an upvote from @steem-plus. Note that the account is only voting once a day and won t be looking at accounts older than 24 hours. SteemSQL is a pay service for a good reason, it is expensive to run such a big database and I m pretty sure it costs more than the money he is getting back. But for small projects I get it that it might be a barreer to entry! Hi! You don t need to notify us, the SPP are sent automatically. With SteemPlus downloaded, you can see it in your wallet. Wow. That is really nice getting SPP by reblogging it. I also love batch buy. 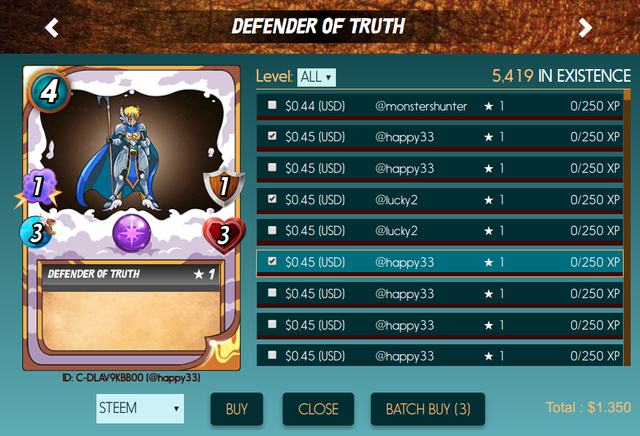 I gonna use Peakmonsters.com because it has a shopping cart. I will wait for your update. Can I reblog the previous post. Yes as long as it s less 7 days old you can resteem. I love @steem-plus. Because this is really awesome. @steem-plus, it is a great project and opportunity. I resteemed your valuable post for more viewers. Best wishes. Steem-Plus is awesome and doing great things! happy to help promote!!! You just got a 14.88% upvote from SteemPlus! that is really nice, thank you for this. Very easier system to earn SPP. Thanks.